September 17th, 2014 by Roy W. Spencer, Ph. D.
Next Tuesday’s UN climate conference in NYC (called Climate Summit 2014) is for politicians, celebrities, and rent seekers. It’s not about climate science, nor Saving the Earth from “carbon emissions” of fossil fuels. Here are ten ways to tell the United Nations really isn’t interested in climate per se. Some of us suspected over 20 years ago this would happen, back when the UN’s Intergovernmental Panel on Climate Change (IPCC) was being formed to help combat “global warming”. 1. There is no way with current technology to get beyond 15%-20% renewable energy in the next 20 years or so….and even that will be exceedingly expensive. No matter how much you care about where your energy originates, physics and economics trump emotions. 2. The UN doesn’t care that global warming stopped 17 years ago. It doesn’t matter. Full steam ahead. 3. The UN’s own climate models have grossly over-forecast warming. Doesn’t matter. Full steam ahead. 5. The UN Climate Summit participants’ “carbon footprints” far exceed those of normal people…and they don’t care. Flying jets all over the world, traveling and dining in style, and telling a billion poor they can’t have inexpensive electricity? That’s the moral high ground? 6. Leonardo DiCaprio, UN’s Messenger of Peace. Al Gore, Nobel Peace Prize and crony capitalist. ‘Nuff said. 7. The leaders of Australia, China, India, Canada, and Germany are opting out of Tuesday’s meeting. They have real problems to attend to, not manufactured ones. 8. A UN official admitted the climate goal was wealth redistribution. Naomi Klein has admitted what Obama, Kerry, and Clinton won’t admit: it’s about stopping Capitalism. Unless you are a crony capitalist friend getting green energy subsidies. 9. What they can’t admit is that global greening and increasing global crop productivity is the result of us putting some of that CO2 back where it was in the first place – in the atmosphere. I’m still predicting some day we will realize more CO2 is a good thing. 10. The UN’s climate reports exaggerate and misrepresent the science. For example, the warming of the deep oceans over the last 50 years is described in terms of gazillions of joules (which sounds impressive) rather than what was actually measured…hundredths of a degree (not so impressive). The resulting average planetary energy imbalance, if it really exists, is only 1 part in 1,000. As I’ve said before, I really don’t care where our energy comes from, as long as it is abundant and inexpensive. But telling the poor they can only have concierge energy – if they can pony up enough money — will end up killing people. Lots of people. And that’s what the U.N. should be concerned about…not having meetings in Bali and Cancun. The “appointment” of Len Crapio to “represent” the summit is all we need to give it the complete loss of credibility it already enjoys. China and India not turning up? Only the two most populous nations in the World giving it a miss, then! Kind of Hamlet without the Prince. And how about Germany?! Isn’t fräulein merkel running the show over there anymore? Germans might just be embarrassed to show their heads at the CO2 Hater Convention. Shutting down nuclear power to light off coal burning plants and still acting like you’re green is somewhat of an embarrassment, I would think. Yup – and littering their countrysides with useless industrial wind factories is beyond embarrassing. So am I. Perhaps more that just a good thing, but hugely beneficial. Unfortunately, if this ever comes true and the bandwagon sways into “CO2 Good”…. based on what we have seen, can you imagine the spewing of pollution the greenies, governments and all those lackeys would do? A nuclear winter would look mild! I am not sure allowing them any say in any environmental matters is good, one way or the other. Hopefully what will happen is that they will leave the environment with the professionals and out of politics and weather forecasting and allow us to do our jobs protecting the environment, telling them what regulations should be like, as it was a few decades ago. I absolutely agree. Great, clear post. Should be printed on a 3.6″ X 8.5″ card with easy-to-remember custom tinyurls for the links. The overall linear trend in 1999 stood at 0.113 degrees C / decade. This increased to 0.138 as of August 2014. Mean temperature for 1984–1999 was –0.095 increasing to 0.154 for 1999–2014. In 1999, the overall average temperature was –0.097. By August 2014, the overall average temperature increased to 0.148. The hottest 20 year continuous period is the latest 20 years. The hottest 10 year continuous period is the latest 10 years. The hottest 5 year continuous period is the latest 5 years. There simply is no hiatus in UAH v5.6. Perhaps we just need to wait for v6.0. and yet if we didn’t have precision satellite sensors, you would never notice it. What’s important is how it compares to model projections, which are the basis for energy policy changes that will hurt or kill millions. So the temperature has changed by hundredths of a degree. So what? The average temperature increased by 0.24 degrees C during the 15 year hiatus period. The overall rate of increase went up by 27%. Perhaps the rate increase is not large enough for some to consider significant, nevertheless UAH v5.6 shows it got measurably hotter and it got hotter faster during the hiatus. So if the phrase “lack of significant warming” actually means “lack of significant warming when compared to some climate models over a specific period”, by all means, have at it. 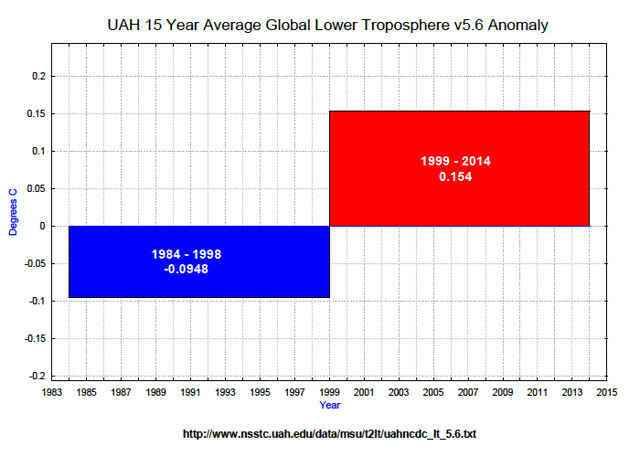 But let’s also recognize that UAH v5.6 shows that global temps are still rising. Perhaps v6.0 will not. And yes, precision satellite sensors help us to detect changes we might not otherwise notice (I certainly appreciate your work in this regard) in the same way microscopes help us see things we might not otherwise notice – small but important things. Strange the RSS data show no warming trend since 1997 and UAH data since 2005. If the trend is within the error range of measurements, the trend is usually called statistically insignificant. In January, New Yorkers don’t worry that it might be 30 degrees C warmer in July. But they should worry it might be 0.24 degrees C warmer in 2030. I guess they are not good statisticians. And put that spoon under a microscope before putting it in your mouth. The world is full of small but important things. How will they know if temps in fact do rise .24 deg C? Will they have sensitive enough equipment to accurately measure it within a significant margin of error over such length of time? Will all factors effecting accurate measurement be accounted for? Will they have access to un-adjusted data? How many competing individuals will duplicate attempts to measure it? How important would and/or could it be? If the temp increase proves important in what way? Will it be beneficial? deleterious, or both depending on who you ask? The term importance begs the question- important to whom and for what purpose? So what is most important is not what actually happened when asserting that something hasn’t happened; but rather how it compares to a model? Interesting perspective. And Ed Millerski still believes CO2 is the control knob for atmospheric temperature! Careful Roy, the forcing is strong in this one! You compare two specific years in a 13 year span and somehow conclude temperatures have not increased. This is a bit like claiming since the temperature on January 21 of some year was the same as the temperature on July 21, temperatures did not increase from winter to summer. But let’s say it’s July 2001. The average temperature anomaly from 1979 to July 2001 was –0.90. By June 2014, the overall temperature anomaly increased to 0.14. If, as you say, temperatures have remained essentially unchanged, how the heck did the overall average increase during that 13 year span? I’m guessing it got hotter. overall January 1979 – June 2014 mean anomaly 0.014. Hotter…smotter…who cares. I’m almost 65 years old and I’ve seen cold, warm, hot, storms, hurricanes, etc at different times throughout my lifetime. Weather / climate is cyclical and who cares if it is 0.19 C hotter or colder. CO2 good…cheap coal generated electricity – good. This whole global warming / climate change / climate interruption is just a bunch of whooee. Mankind for ages has adapted and will always adapt. All we are doing is wasting a ton of money and a lot of hot air arguing about a nonsensical issue that won’t change one iota of what our world will do. Get a life and go do something useful and beneficial like spend more money on medical research instead of for a cause that only exists in your mind and the minds of other useless progressives who for years have been feeding at the public teet. Unfortunately, the AWG campaign and meme is having a great deal of influence on what people do, and are able to do. Resources are being transferred from pro- to anti-survival activities. Just ask the Germans who are scavenging and stripping their Holy Forests for firewood! Why cherry pick. Let’s go back to the Holocene optimum. It was a tad warmer then and it’s been cooling ever since. This little bit of warming we’ve enjoyed last century was a blip. It means nothing. It will cool again and we will miss that warmth. By coincidence, the Holocene Optimum was when the first cities and civilization took root. That’s why the Pure Greens hate it. Are you trying to argue there is no warming hiatus? Seriously? Then why is the global climate scientific community desperately trying to explain it away with many and various theories as to why it IS happening? There is, in fact, a broad consensus among scientists (say 95% for a round number) that the Hiatus exists. The “warming Hiatus” does not mean zero warming. It means the human element is absent. Warmists cherry picked a starting date for their “data” (1880) a couple decades after the little ice age. The Earth should be warming naturally, slowly. Just as it is and has done in every period between ice ages. What is missing is the expected additional heat from the human CO2 emissions. We have to consider the fact that the satellite data covers a period in which there were 14 (“warming”) El Ninos of which 3 were strong and 10 (“cooling”) La Ninas of which 0 were strong. It is possible that warming is EXPRESSING itself through this imbalance in which case it can be projected. It is possible that the imbalance is purely down to CHANCE in which case the effect cannot be extrapolated to the future. It is possible that there is a deterministic CYCLE such that there are lengthy periods where there are more El Ninos and also lengthy periods where there are more La Ninas. The “hiatus”, which is the word used by the IPCC, could be the beginning of a period of dominating La Ninas. The data itself is no help at all in deciding between these possibilities. We also have to allow for the fact that it has been a long time without a cooling volcano. I do not put quotes around the word ‘cooling’ because the effect is a genuine cooling arising from an increase in the albedo of the earth. Ed, you are cherry picking a starting point. Here are all the possible results doing a linear regression between 20 to 10 years ago and today. You seem to have picked an outlier. Removing too many is what is usually referred to as cherry picking. You’re only looking at an one outlier! Robert, I haven’t cherry picked a date, I’m simply using the date some claim is the beginning of the “hiatus”. Here’s a graph of the all linear regressions since January 1979 of the UAH v5.6 data. So in 1999 we would have said the linear trend from 1979 to 1999 was 0.113. 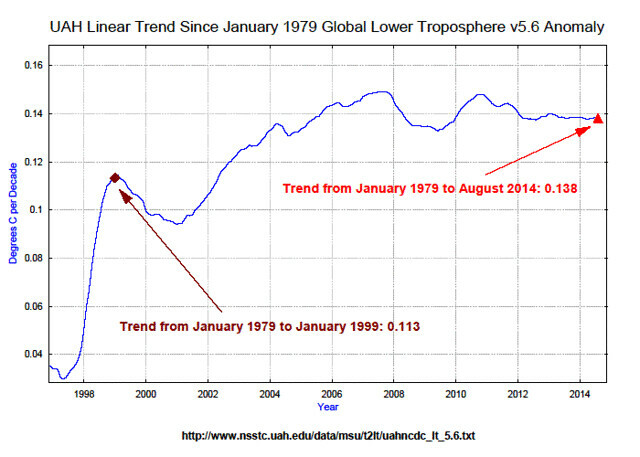 By August 2014, the overall trend increased to 0.138 during a period of “no global warming”. Here’s a similar plot of the average temperatures. Again, in 1999 we would have said the average temperature for UAH v5.6 from 1979 to 1999 was –0.097, yet by August 2014, the average increased to 0.015. So both the average temperature and trend increased during a time of no warming. You can certainly maintain these changes are natural or insignificant or whatever, but to me, claiming “no global warming for the past 15 years” is just as misleading and disingenuous to the public as claiming “the science is settled”. The globe is still getting hotter and hotter, I’ll leave it to the experts to tell us why. That plateau in the data is the cessation of warming. And yet, the 10 year moving average shows that the hottest continuous decade in UAH v5.6 is the last 10 years. but 13% more CO2 in the atmosphere since the start did nothing. You’re missing the point because of the noise. Here is a plot of the derivative (10 year smoothing) and linear regressions (to the unsmoothed derivative). The warming accelerated in the first two decades at half the value of the deceleration in the last two decades of the data (with a large uncertainty). This is more consistent with natural oscillation in the climate rather than a strong correlation with increasing rate of fossil fuel use. Say it’s 1999 and someone claims “there will be no global warming for the next 15 years”. 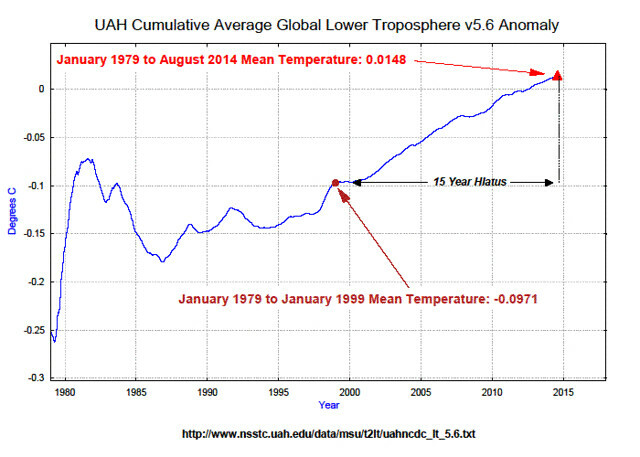 The average temperature computed from UAH v5.6 for the previous 15 year period (1984 through 1998) was –0.09. We then find the average from 1999 through 2013 rose to 0.15. So the 15 year average temperature rose by 0.24 degrees. This works out to a warming rate of 0.16 degrees C per decade during a period of “no global warming”. Lest you think I’m cherry picking, you choose the start date and duration of the hiatus. Tell me what the average temperature was for your hiatus interval just prior to your start date and for the same interval just after. I betting it gets hotter in virtually every case. Again, some may maintain this is entirely natural or completely insignificant, but it is undeniably real as far as UAH v5.6 goes and seems a bit contrary to the much repeated notion of “no global warming”. The rise occurred before 15 years ago, not during the last 15 years. The 10 year moving average has remained the same for the last 5 years. The rate is zero. The world has not warmed. Is this significant? Well the IPCC think so. 52 excuses for it from warmists says that you are denying the consensus. Warming has ceased when it shouldn’t have. Well, now you appear to be arguing for a 5 year hiatus so the discussion becomes more about weather than climate. The hottest continuous 20 year period is the last 20 years. The hottest continuous 15 year period is the last 15 years. The hottest continuous 10 year period is the last 10 years. And even the hottest 5 year period occurs in this year. So perhaps the statement “warming has ceased when it shouldn’t have”, actually means “the globe continues to warm, but not in accordance with some climate models over some interval, therefore warming has ceased”. Though based on the numbers, you can certainly maintain the warming is natural or inconsequential or even beneficial, you just can’t say it has ceased. I would guess the errors and the noise in the system would destroy the claims of accuracy to two decimal places. I don't think it has been about climate science for a very long time. Apparently Australia, China, India, Canada, and Germany aren’t too keen on global governance. The climate skeptics are never in agreement amongst one another unlike the proponents of AGW theory. My question is if the temperature trend for the globe were to actually drop would you Dr. Spencer be more on board with the points I have been trying to make in regards to what may or may not govern the climate? Yes, if the temperature trends were to actually drop, I would be more open to more controversial theories of climate change. I don’t think that’s going to happen…but who knows? If temperatures were to drop over the next few decades AND solar activity was to enter a grand minimum, as predicted by a lot of solar physicists, would that indicate support for a controversial theory? I.e. is a solar driven climate a controversial theory? yes, I consider solar driven climate CHANGE is controversial (non-Milankovitch, that is…say, due to solar cycle modulation of cosmic rays). In which case the next few years will tell the tale. Two big cycles bottoming between now and 2020 — deVries and Gleissberg. So it will be interesting to see how well the solar driven theories play out. I think the real question would be, if the temperatures drop, would the AGW folks admit it, or would the continue to say that the world is warming? I’d say they’d admit it if they had moved on to another way to collect rent, redistribute wealth, and smash capitalism. And they would deny it if they had not yet figured out what the next scam should be. The warmists could be up their you-know-whats in snow in the middle of June and still they would be going on about CO2. They drank the Kool-Aide years ago. This is religion, not science. Was it ever about the climate? They’ve pretty much given up on temperature and now focus on extreme weather. If that doesn’t pan out, they can always go to ocean acidification. No, this is not about climate, it’s about CO2 (i.e. fossil fuels). And there is a whole range of different interests that love to see CO2 from fossil fuels labeled as a villain. Likewise if solar activity is prolonged and quiet and the global temperature trend does not decrease I would be more on board with your thinking. There is an assumption in that statement that the methodology used is providing accurate data. But since satellite measurements contradict it, it may be a red flag that the methodology being used to determine UAH is flawed and untrustworthy. 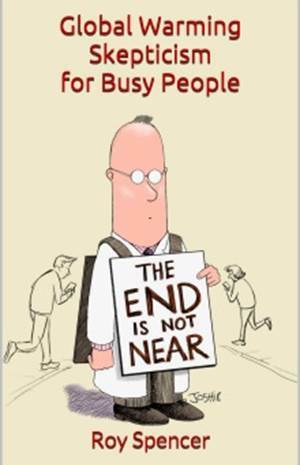 Sadly, too many AGW believers fudge and cheat to keep the faith alive. The credibility of these biased scientists has diminished significantly. I do not trust them to be objective. Remember, their software models have proven wrong for 17 years yet they still maintain that these models are reliable. A theory that has show to be unable to predict an outcome needs to be abandoned according to the rules of scientific methodology. AGW is no longer science. It is also far too misanthropic to be objective. Environmentalism needs to reform to regain credibility. well, we are “UAH”. Started the dataset over 20 years ago. Our new version 6 looks like it will be closer to RSS, which most “skeptics” refer to these days, since it shows no warming since the 1998 El Nino. Which by itself is ironic, if you know the history of UAH vs. RSS. > If only RSS could definitively show that the UAH is wrong. I know two brothers of equal intelligence. One is argumentative, has idees fixes, is always picking over old grievances – and loves to be right. thinks about his mistakes, but then moves on – and would rather be rich than right. Guess which one IS rich. “But telling the poor they can only have concierge energy â€“ if they can pony up enough money â€” will end up killing people. Lots of people.” IMO this is considered a feature by environmentalists. Often the left is caught pontificating that humans are a virus and need to be culled in order to “protect” the earth. Yep! It should not be considered an unintended consequence either. They’ve known all along. These issues have been hashed over a long period. Our politicians unconstitutionally restrict their own citizens access to the world’s hydrocarbons in support of other nations. What’s new about tyrrany? Both the UN and the EPA have stated goals of reducing greenhouse gas (GHG) emissions to 80% of 2004-2005 levels by the year 2050. For CO2, this would be equivalent to usage by the US in about year 1900, and by the world in the 1940s. The US has already reduced GHG by ~15%. primarily through greater efficiency in use of generated power and by increased use of natural gas (NG). Most US GHG arise from fossil fuel burning, whereas that for the world has a greater proportion from land use practices. What would be required for the US to reduce GHG by an additional 80-15=65%? Additional increased efficiency and control of methane emissions (about 9% of GHG for the US) could, in principle, give several percent. (Land use in the US has already decreased emissions.) To go beyond that requires less burning of fossil fuels. Total substitution of gas for coal in U.S. energy production might decrease the US GHG emissions by up to ~28%. If natural gas vehicles, or electric vehicles where the electricity is generated by burning natural gas, were to totally replace oil-powered vehicles, then U.S. CO2 emissions might be reduced an additional 9%. That would bring the total US GHG reduction to about 40%, or half of the stated goal. The only way to approach an 80% GHG reduction in the US would be by phasing out the burning of all fossil fuels, including NG. That would imply producing most energy from “green” sources (including nuclear). Achieving an 80% reduction target for the world would be even more difficult. I’ll give you 213 trillion reasons why we will continue to burn fossil fuels. The world’s proven reserves amount to some $213 trillion US. The U.S. has something like $23 trillion worth of fossil fuels sitting in the ground. Now, with just about every country saddled with trillions of dollars in debt (the US national debt is a littler more than $17 trillion), tell me what country in their right mind is going stop burning fossil fuels. I don’t disagree. My comment is not an advocacy, just documentation. Coal may be phased out, certainly in the US. But I expect use of NG to significantly increase. By 2050 I see no way to achieve more than 40% GHG reduction, and it well could be less. I’m not sure why you’d even consider nuclear…the greens don’t. ddt was NOT banned for mosquito control. It can still be legally purchased. The mozzies became resistant to it – they still do not like it so it is sometimes used on bed netting. At peak DDT use, roughly 1958 to 1963, 4 million people died from malaria every year. 500 million got malaria infections. Today, malaria deaths have been reduced by more than 80% to well under a million/year (~620,000); infections have been reduced to fewer than 250 million per year. Most of these reductions have been achieved without DDT, because DDT resistance makes the stuff not first choice any more (to fight malaria, insecticides are used indoors, in Indoor Residual Spraying, or IRS; outdoor use doesn’t work well and quickly breeds DDT-resistant and -immune mosquitoes). So, there was no ban on using DDT to fight malaria; the U.S. ban on DDT covered crop use only, and only in the U.S. (EPA has no authority to ban a substance in foreign nations; as a pragmatic matter, the EPA order in 1972 gave an exemption to DDT manufacturing in the U.S., so the manufacturers wouldn’t go broke; for most years after, 100% of U.S. production went into exports to fight disease outside the U.S.; for that matter, WHO also lacks any authority to ban any substance in any nation. DDT has never been banned in Africa, Asia, nor South America). And, using methods Rachel Carson championed, malaria deaths have plunged, saving millions of lives. There is a public record on all this stuff. Carson’s book is still in print, EPA has records at their website, WHO publishes an annual report on the fight against malaria. If one opposes acting on global warming because one has been hoaxed about DDT, should we worry about the claims against doing anything about global warming? Why would capitalists bother with green energy if not for huge profits? It’s greed in the guise of saving the world and stopping capitalism. That’s the whole point Roy. They also believe the world is overpopulated. A man-made catastrophe will restore balance and harmony with nature. Not about climate? Well of course not, how could it be? The definition of climate is the weather of a particular region, area or place over a long period of time. “Climate change” — the way it is used to replace the now out of odor “Global warming” — does not exist, since there is no such thing as universal climate. Climate varies from place to place, varies by latitude, by longitude, by altitude by the presence or absence of large bodies of water nearby and various other geologic features. I doubt that any one is going to argue that the climate in the vicinity of an active volcano is going to be different from the climate of a nice beach on a tropical island, for example. There is no such thing as a universal climate, so there is no way that any one single factor is going to influence every climate in every single location on the face of the earth. Each region, area, location and place is going to vary according to the circumstances which are unique to them and according to the features which define them. In some places, higher co2 is likely to be very beneficial. In others, it may make no difference. There may be some places which might be adversely affected. But one thing for sure, there is no way to predict how any particular place will respond and for certainty, there is no way to predict that each and every place on the face of the earth will be adversely affected. That is not to say the sun going rogue or the sun going dim could not do it, but if that happens it’ll be over for all of us anyway. Short of an event that extreme, the climate of various specific places has varied over the course of history and will continue to vary far into the future. The earth has made it this long, some more co2 is not going to do it in any time soon. It is time to give the IPCC a good solid dose of Ipecac and send it on its merry way. You simply cannot talk about Man Made Climate Change without first talking about Man Made Global Warming because that global warming is supposedly caused by our CO2 contribution. If there is no Man Made Global Warming our CO2 cannot be blamed for whatever happens to the climate. It is a simple principle that seems to be overlooked. The only means by which our burning of fossil fuels can change the climate is by way of global warming as measured by thermometers in our atmosphere. It doesn’t matter if the heat is going into the oceans when it doesn’t show up on the ARGO buoys or in the effect that heat is having on our atmosphere. Without our heating the atmosphere, particularly the stratosphere, where our weather takes place there can be no possibility of our causing the weather to change. There are many activists who try and change the whole playing field let alone the goalposts. You have to stay focussed on Global Warming and our part in it because everything flows from that. Every metric, rain, snow, global ice, hurricanes, tornadoes, sea level change, wildfires show that nothing is getting worse and many are getting better. If we aren’t making the atmosphere hotter we cannot be changing the climate. Do yyou mind if I quote a couple oof your posts as long aѕ I propvide credit and sources bak tߋ үߋur webpage? alright ԝith ʏօu. Ƭhanks a lot! Exactly! The biggest crime in all this is that world’s poorest people are going to suffer unnecessarily. Human beings have the technology and fossil fuels available to provide cheap, reliable electric power toeveryone on Planet Earth who wants it. What stands in the way? Foolish liberals and the Intergovernmental Panel on Climate Change. It is heartbreaking. Or is it better to give them £1000 of batteries and solar cells and let them have locally managed free power for water purification, lighting and computers? When costs are calculated over 40 years, overhead cables were found to cost between £2.2m/km and £4.2m/ km to install and maintain, compared with between £10.2m/km and £24m/km for those buried. Costs varied according to the technology used and the voltage of the lines. Why are we to give them anything? Let them develop their own country. It is best they learn to do it for themselves. This notion that developed countries are to altruistically provide for other less developed countries has never and will never work. Personally, I owe them nothing. The whole argument that we owe others is immoral. So, can we move on from this worn out dogma? The scary part is that these people with sinister motives have the monetary resources to overwhelm all logic and reason. We mustn’t forget that they relentlessly put out their propaganda to a public that is ignorant, apathetic and far more concerned about ‘Dancing with the Stars’ and ‘Monday Night Football’. Because of such things these agenda-driven people encounter very little opposition to their plans. John Q. Public won’t complain until it’s too late and the evil-doers have attained their objectives: wealth theft and redistribution and further concentration of power. New record ice in Antarctica. Ren, best to include the full story, not just a provocative title. Land ice in Greenland and Antarctica is still decreasing at rapid rates, and Arctic sea ice is back to the decreasing trend line following the record minimum in 2012 and the rebound last year, while Antarctic sea ice area is increasing following well understood changing wind patterns. Sea ice volumes, however, tell a different story. The accuracy of the GRACE satellites is insufficient to show that the land ice is decreasing with any degree of certainty. My understanding is that Antarctica seldom gets above freezing. With regard to the Arctic we have no really reliable way to measure the volume and certainly no decent historical record to indicate trends at all. 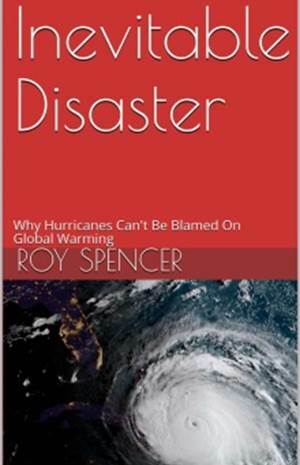 Roy, I used to enjoy reading your take on AGW,but this latest blog depresses me given the nonsense and circular references. Certainly Australia’s CSIRO thinks crop yields (wheat, maize and rice) will decrease 5% for every degree c of warming. And who knows what will happen to pollinators, pests, water, etc that all affect yields as conditions change. My father was a horticulturist and used co2 in his greenhouses, but controlled temperature day and night, water, fertilisers, pollination to achieve what he wanted-not a simple exercise!. Like you, I don’t care much where energy comes from so long as full costs are included. For coal this must include the health costs. All energy sources should not be subsidised. Given the state of land ice, sea temperatures, sea levels, sea pH, and even surface temperatures, it is clear even to me, a “neutral”, that warming is still with us. How much is due to co2 is a question but I prefer to take the low-risk road, and here I defer to the big reinsurers, who it must be said listen to the climate experts, not the increasingly sarcastic blogs like this is becoming. The C in CAGW is based on one thing – models that have an extreme positive feedback bias, and which are being shown inaccurate. Shooting ourselves in the foot or throwing a virgin into the volcano is not a low-risk road. Its real damage. Admittedly, sarcasm is tame compared to what the alarmists and their allies use – but I still don’t see the justification in mimicking their despicable behavior. Things like illegalizing and punishing dissention (Al Gore: there should be an economic penalty, Professor wants climate change deniers thrown in jail, etc. ), denial of publication (East Anglia emails, etc), brute force peer pressure (Lennart Bengtsson, etc), legal/regulatory pressure (EPA, Sierra Club, etc. ), scaring children and populations with concocted what-ifs (phys.org, you, etc.). Sarcasm may not accomplish as much, but it’s certainly justified. And the skeptics do not have the near infinite media/government/NGO resources of the alarmists. Dr. Roy, I usually only agree with 97% of what you write. But this time, it is 100%. Thanks for this. I have saved the post as a PDF. 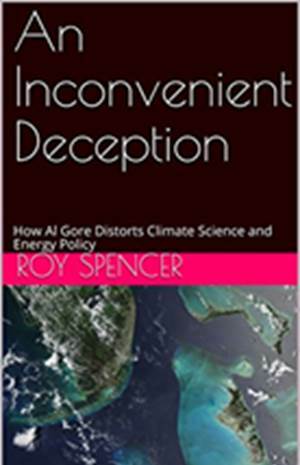 I have only one substantive comment based on a comparison of Dr Spencer’s ocean heat model. With a crude model extending to 700 meters depth, I confirmed the consistency of Dr Spencer’s climate sensitivity to CO2 of +1.3 degrees C with Hansen’s 2011 estimate of +0.58 Wm-2 as the rate net energy added to the world ocean. “The net energy balance is the sum of individual fluxes. The current uncertainty in this net surface energy balance is large, and amounts to approximately 17 Wm–2. This uncertainty is an order of magnitude larger than the changes to the net surface fluxes associated with increasing greenhouse gases in the atmosphere (Fig. 2b). The uncertainty is also approximately an order of magnitude larger than the current estimates of the net surface energy imbalance of 0.6 ±0.4 Wm–2 inferred from the rise in OHC. The uncertainty in the TOA net energy fluxes, although smaller, is also much larger than the imbalance inferred from OHC. This appears on the surface to be a radical statement by a scientist whose views are considered by many to be unconventional. However, the two papers mentioned above come to the same substantive conclusion, and the authors are, or in Hansen’s case was, scientists employed by NASA, other U.S. Government agencies and their associates. I conclude tharefor that the EPA and the President don’t listen to what their leading scientists are saying. I conclude further that, owing to lack of precision in measurements, the net incoming energy may be greater than, equal to, or less than the energy leaving the Earth. NASA cannot say for sure if the Earth is warming, remaining the same, or cooling. The observations are not precise enough to tell us for sure that some other climate phenomenon does not completely counteract the warming effects of greenhouse gases, including the warming effect of CO2. The climate alarmists are not paying attention to advances in climate science. Looking at the historical record the times in which life originated on this planet and life’s greatest expansions occurred when temperatures and CO2 levels were many times higher than at present. Knowing that how can one conclude that CO2 is a bad thing ? Warmists have convinced themselves without looking at the facts, but the real culprits are the politicians who see “green” issues as golden opportunities to raise taxes to waste on silly projects. Mrs Merkel isn’t going because she has closed the clean nuclear power stations and changed to coal. « What if the Global Warming “Pause” was “Fast Forward” Instead?